How do you become a member of Old Nick? It’s very simple. There are no membership application forms to fill out, no membership fees to pay, and no character references required. The only way to become a member of Old Nick is to be part of an Old Nick production. Any production. 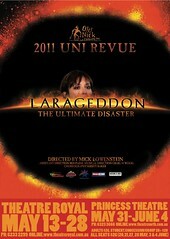 It can be as part of the annual Uni Revue, a staple of Tasmania theatre. Or you can be part of one of the many other productions Old Nick stages – everything from play readings and one-act plays, to full-blown musicals! Just pick the production that interests you. And you don’t have to be an actor and appear on stage. Every production has a wide variety of positions, including building, painting, wardrobe, props, stage management, lighting, and several dozen other positions. There is bound to be at least one position that suits your talents. And if you want to expand your skills, Old Nick provides the perfect venue for that. Productions vary in size and type, ensuring Old Nick members get a chance to experience a wide range of shows, from the “low” comedy of Revue, to the high drama of Shakespeare. And there are other benefits. Once you become a member, you are a member until the end of the following year. For instance, if you are part of the Uni Revue in May, then you are an Old Nick member for about 19 months! Plus, there are various social functions, such as the annual Old Nick dinner and the upcoming members movie nights. If this has spiked your interest, keep an eye out for audition notices in the news and on this website, or use the details on the contact page of this site and send an email to our secretary.